Raymond Vargas, 62, passed away surrounded by friends and family, Saturday February 2, 2019 at Great Plains Medical Center in Elk City, Oklahoma. Mr. Vargas was born in Post, Texas on April 6, 1957, to Domingo and Alifonsa (Zapata) Vargas. Moving to Southwest Oklahoma during the late 1950â€™s, Raymond worked for several farmers in Southwest Oklahoma and on the Texas Plains, doing agriculture work. He truly enjoyed chopping cotton. Playing the guitar, racing cars, fishing were some of the things that Raymond enjoyed but spending time with his family and friends was what he enjoyed most in life. There wasn't a day in his life he didn't listen to or play music he lived and breathed music. He could drink pepsi or coke and eat cheetos all day long. Raymond was preceded in death by his parents, four brothers, Marcos Vargas, Pete Vargas, Isabel Vargas and Augustine Vargas and three sisters, Martha Alcorta, Mary Rosales, and Trina Vargas. 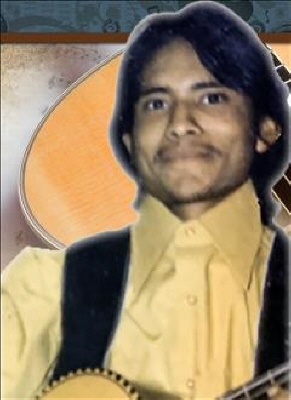 He is survived by two children; Daughter, Ramona Vargas, Son, Raymond Vargas, Jr., four brothers; Ruben Vargas and wife Tammy, Frank Vargas and wife Crystal, David Vargas and Jessie Vargas; three sisters; Anita and Joel Rubio, Janie and Jose Renteria, and Dominga Vargas, along with numerous nieces and nephews. The Vargas family will receive friends 6:00 p.m. - 8:00 p.m. Tuesday, February 5, 2019 at Harmon County Funeral Home, Hollis, Oklahoma. Funeral services for Raymond Vargas, will be at 2:00 p.m., Wednesday, February 6, 2019, at Harmon County Funeral Home Chapel with Rev. Freddie Reyes officiating. Interment will follow at Fairmount Cemetery under the direction of Harmon County Funeral Home of Hollis. The family of Raymond Vargas wants to thank the staff at Bell Ave Nursing Center in Elk City for all the care and compassion that they have shown to Raymond the last few years. To send flowers or a remembrance gift to the family of Raymond Vargas, please visit our Tribute Store. "Email Address" would like to share the life celebration of Raymond Vargas. Click on the "link" to go to share a favorite memory or leave a condolence message for the family.